1. Obtain original IDT pointer from a specific register to retrieve the address and size of original IDT. 2. Create new IDT by allocating one page and memory copy from original IDT. 3. In new IDT, modify the divide_error entry with the new address that point to my assembly handler. 4. My assembly handler would call my C handler first and then just simply jump to the original assembly handler. 5. The address of original assembly handler is obtained in System.map and is hardcoded in the source code. 6. Create new IDT pointer based on new IDT. 7. Active new IDT by loading new IDT pointer to that specific register. 8. Recover by loading original IDT pointer to that specific register. All source code could be found in Appendix at last. 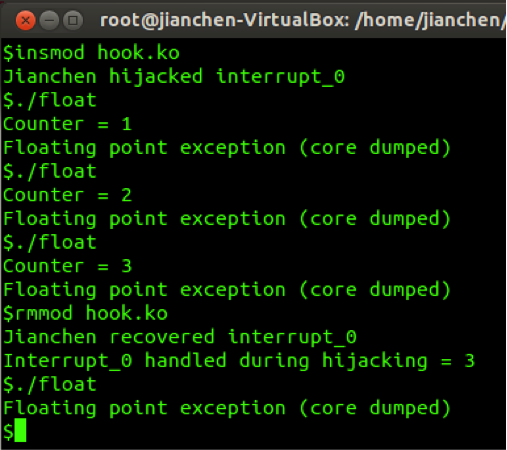 Moreover, the following snapshot would demonstrate my work, which is tested in Linux kernel 3.12.6.